Creativeity can be nurtured and developed. I find ideas around every corner and deliberity make choices about their possibilities. All anyone has to do is look around and really see. So tonight I will raise a glass and reflecton my blessings,my accomplichments of 2007 and my hopes for 2008. Happy New Years from the daily painters. 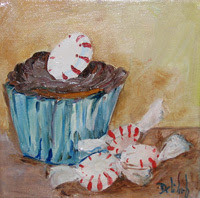 A new years cupcake.12x6 in oil on gallery wrapped cavas. CHORUS: For auld lang syne, my dear, for auld lang syne, we'll take a cup o' kindness yet, for auld lang syne.And surely you'll buy your pint cup !And surely I'll buy mine !And we'll take a cup o' kindness yet,for auld lang syne. CHORUS: We two have run about the slopes,and picked the daisies fine ;But we've wandered many a weary foot,since auld lang syne. CHORUS:We two have paddled in the stream,from morning sun till dine? ;But seas between us broad have roaredsince auld lang syne. Lavendar Field 20x24x1 1/2 oil on gallery wrapped stretched canvas wired and ready to hang. I love tropical flowers. Hibiscus are so much like paper the way they ruffle with the bright colors.Hibiscus on blue is a painting a day full of color. When you are in Florida you just want to paint bright colorful things.I am here enjoying the sunshine and painting. Orange Parrot is an oil on stretched gallery wrapped canvas. 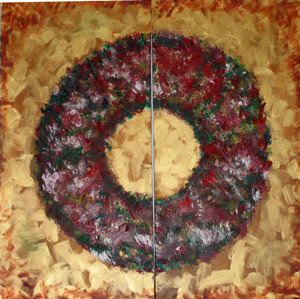 This painting is wired with painted sided and can be hung as is. I think an artist looks at the world differently. We look at the colors the shadows and the the relationships. The artist eyes sees many things. I'm back at my studio in Florida and just had to paint some fun things. Sea horses are like unicorns they seem almost magical but unlike unicornes they are real but very small so I decided to make them large and playful. That is the great hting about being an artist you can paint your own world, even below the sea. Its alway fun to go to the party but when you get home and kick off your shoes its time to relax. This painting has been sold to purchase a painting like this one please send me an email. send me an email to purchase with a check or ask question. 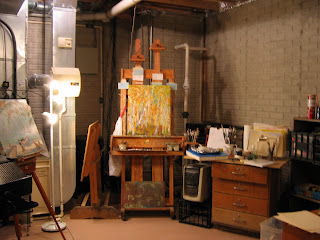 Today those of us who are daily painters are posting a picture of our studio or where it is that we find space to paint. I have a large are to paint in with several tables. One for cutting matts, one that is set up for watercolors when I do them which isn't often. I am an oil painter. I also have a table with a computer on it. This is used just for painting. My office is in a different area and my other two computers are there, along with my files. 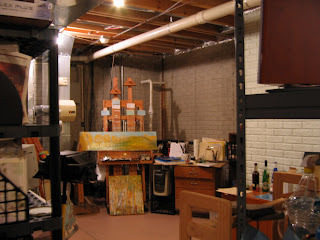 This area where I paint also has a 15x20 feet area where I have shelve where I store paintings, matts,frames,and canvas. I will be building a new studio soon where the light will be better and I will have better storage space. 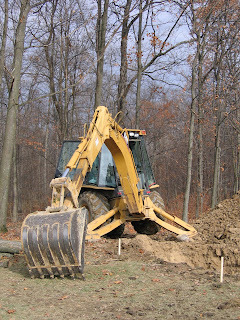 The digging has started but it will spring before it is done. When it's Christmas you need red polish to put a holiday glow on your nails. 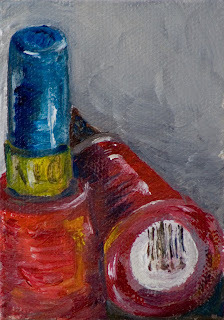 This is an ACEO it is 3.5x2.5 oil on stretched canvas. Painting fruits and vegetables that are full of color makes an eye catching still life. 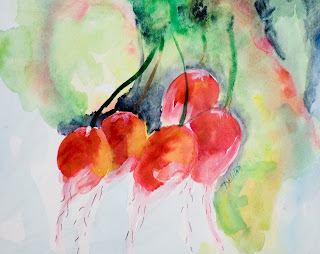 The flow of the watercolor adds interest to this painting of vegetables. This is a watercolor done on 140lb coldpressed watercolor paper. It is 9x12. Bright vegtables and a sunflower make this painting a secret garden of nature. Sunflower and Fall Vegtables 6x8x1 1/2 oil on gallery wrapped canvas. This painting has painted sides and is wired ready to hang. 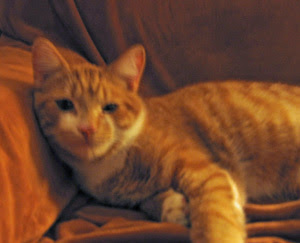 Mother natures colors are so wonderful and bright I can not come close to the intensity of the reds and oranges I see. This is an oil on hard board. It has a clear seal to protect the work. 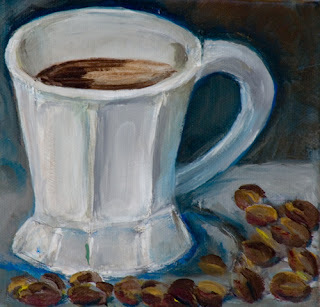 Fress Beans, painting by Delilah Smith"
I grind my own coffee beans every morning so for my painting a day I thought I would paint the cup of coffee with a few beans. Hot Coffee and Fresh Beans 6x6x1 1/2 oil on gallery wrapped canvas. This painting is wired and ready to hang or it can be framed if you like. Click above to buy from my ebay store at $50.00 plus $3.00 shipping. Michigan snow is heavy on the trees right now. My painting a day had to be about some snow. Maybe we will get enough snow so that we can ski over the holidays. Snow on the Pines heavy impasto work on gallery wrapped stretched canvas 11x14x1 1/2 done in oil. 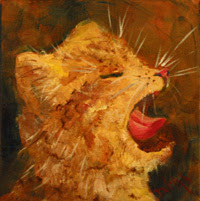 Big Kitty Cat Yawn is painted in oils it is 6x6x1 1/2 oil on gallery wrapped stretched canvas wired and ready to hang or it can be framed. I believe in Christmas. The cheerful "Merry Christmas" of my childhood, when my father was still alive. How could I not believe in Christmas? I believe it's worth celebrating that Jesus came to earth and made possible the first Christmas. I believe in myself. "We have to learn to be our own best friends because we fall too easily into the trap of being our own worst enemies.--Roderick Thorp, Rainbow Drive. I'm sure there are angels all around all year but at Christmas time they must be just a little closer to us and our loved ones. 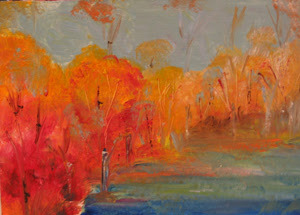 Cheerio Christmas Tree 7x5 oil on hardboard.Click on the link to buy from my ebay store no bidding on this painting. Vine Ripe tomatoes 6x8x1 1/2 oil on gallery wrapped stretched canvas wired and ready to hang. One Chick and eggs 6x6x1 1/2 oil on gallery wrapped canvas with painted sides. It is wired and ready to hang. Cup Cake and Jelly Beans 6x6x1 1/2 oil on gallery wrapped canvas wired and ready to hang. H is for Hubbard Squash 6x6xx 1 1/2 oil on gallery wrapped stretched canvas with painted sides wired and ready to hang or it can be framed if you like. Popcorn and Cranberries are being strung for Christmas. This is a great way to decorate the tree and have fun. Oil on hardboard 5x7.